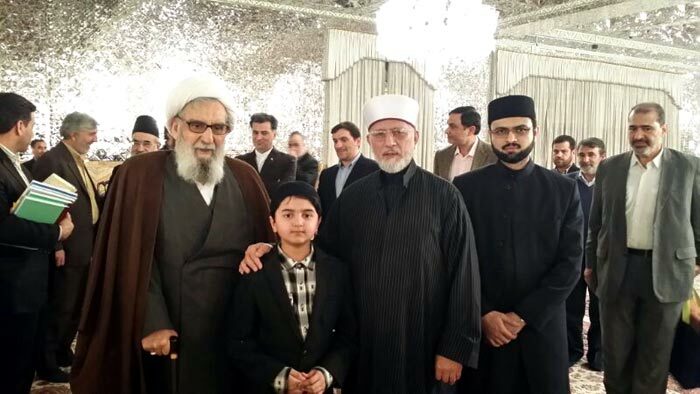 JNN 23 Feb 2014 Mashad : A prominent Pakistani Sunni scholar Allama Dr.Tahir ul Qadri visited the Holy Shrine of Imam Reza (A.S.) in his trip to holy city of Mashhad, Iran. He asserted, “The wise look and devotion along with the attempt of Ayatollah Waiz Tabasi, the Grand Custodian of Astan Quds Razavi, causes this complex to achieve such development, promotion and flourishing. This entry was posted in Asia Pacific, Iran News, Pakistan News and tagged Allama Muhammad Taher ul-Qadri, Astan Quds Razavi, Holy Shrine of Imam Reza, Imam Reza shrine, iran, Mashad, Razavi Holy Shrine, Sunni Scholar, Tahir Ul Qadri. Bookmark the permalink. DOUBLE MOUTHED , HOW ONE CAN LOVE SOMEONE AND REVERE HIS ARCH ENEMY TOO , UMAR, BAKAR USMAN ARE NOT ONLY THE USURPER OF THE KHILAFAT OF IMAM REZA (a s ) ‘S GREAT GRAND FATHER , BUT THESE CRIMINALS MARTYRED THE UNBORN SON OF THE PROPHET’S DAUGHTER BUT THEY MARTYRED HER TOO. BIBI AYESHA WAGED A WAR WITH MAULA ALI (A S ) HE HAS ALL PRAISE FOR HER AND MAULA TOO .